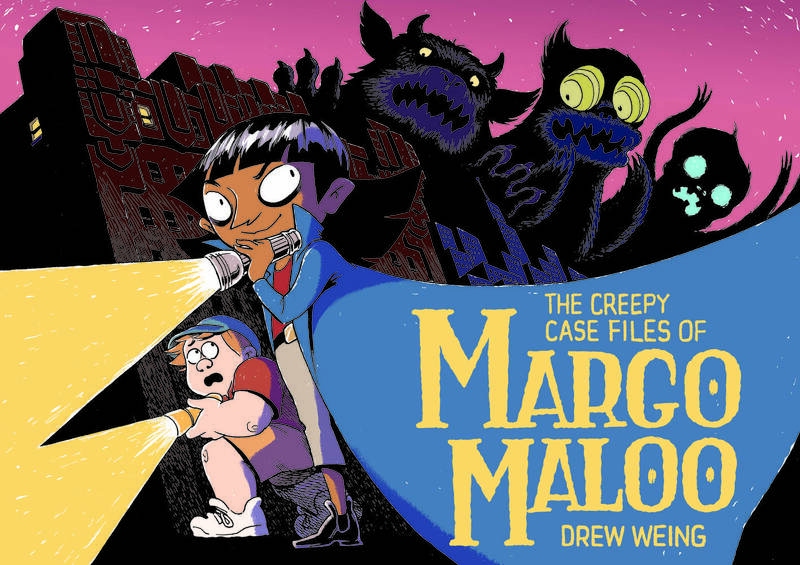 Putting an active spin on the Monster-In-The-Closet story, The Creepy Case Files of Margo Maloo, written and illustrated by Drew Weing, humanizes monsters and presents kids with challenging and irresistible adventures. Readers follow Charles, a reluctant transplant to Echo City, as he grumbles about his new home while discovering local secrets even longtime residents don’t know. Charles’ new neighbor Kevin, who quests to beat any world record he can, is the only person who also believes there are monsters about. When he gives Charles Margo Maloo’s business card, the excitement really begins. Along the way, Trolls, Ghosts, Ogres, and a host of creative monsters (including one that looks an awful lot like a Blobfish) are discovered and reasoned with and even defended. All the while, Charles learns more about his new home and challenges his fear and displays ever-growing courage and acceptance of The Other. The rich and detailed illustrations shift from light to dark for mood, and the more you look, the more hidden details and characters you will find. Details like a jar of peanut butter (with flax) and hidden Ogre eyes help develop the characters and the story. What I especially liked about The Creepy Case Files of Margo Maloo was the casual but direct manner issues like gentrification, stereotypes, and challenging both fear and bias were addressed. Charles’ parents have purchased a dilapidated apartment building, and they are working very hard to renovate it (read: they are not wealthy developers), but there are also current residents (human and monster!) in the building who are affected by the renovations. In addition, time and again, Margo helps Charles see that the monsters they meet have personalities, families, and even businesses; they aren’t just there to scare kids. In fact, in each instance, it’s the kids who have disturbed the monsters — whether unintentionally or through meddling — and created the monster emergencies Margo is called to solve. The Creepy Case Files of Margo Maloo will entrance kids and their grown-ups with its realistic dialogue, well-rounded characters, and mysterious situations. Everyone will root for Charles as he becomes more and more of a Monster Expert, cheer as Kevin continues his quest for a World Record, and wonder admiringly about who — or what — Margo Maloo really is. Hopefully the next book will give us more of the same. Highly recommended for ages 8-12+.